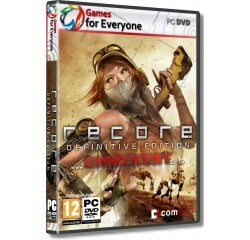 ReCore Definitive Edition (Windows 10) - R180,00 : Game Hunt, Where we lead, others follow. From legendary creator Keiji Inafune and the makers of Metroid Prime comes the "ReCore Definitive Edition", an action-adventure masterfully crafted for a new generation. You are "Joule Adams", one of the last remaining humans on the planet "Far Eden", a mysterious and dangerous world controlled by robotic foes bent on your destruction. To survive you must forge friendships with a courageous group of "Corebot" companions, each with unique abilities and powers. The ReCore Definitive Edition includes the new "Eye of Obsidian" adventure. Join the plucky Corebot "Violet" and journey into the permanent midnight of the "Starving Sea", a previously unexplored region of Far Eden where ancient enemies plot their revengeâ€”on Joule and all humankind! Processor - Intel Core i5 3550 @ 3.3 GHz or AMD FX-6300® or equivalent AMD® processor.